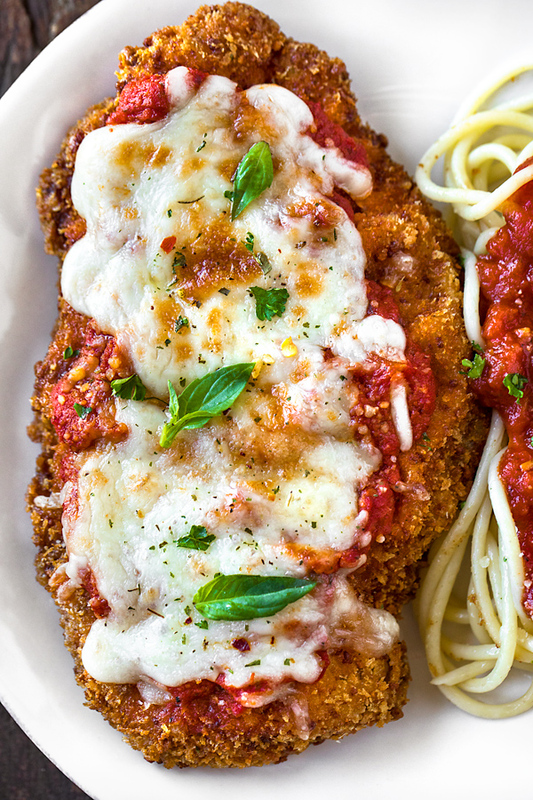 This chicken parmesan is a cozy classic that’s prepared with a rustic, chunky marinara sauce and a hefty sprinkle of fresh basil—it’s deliciously crispy and cheesy! Whenever we go out for Italian, I’m often drawn to order the chicken parmesan, the ultimate form of Italian-American comfort food in my book. I must admit, however, that I’m not always finding myself head-over-heals in love with the restaurant’s version, as it can sometimes lack some homestyle goodness and some flavor. I really want to love the dish when I order it out, but many times it seems as if the chicken itself isn’t all that flavorful, and the outer coating a bit on the greasy side. So more often than not, when I get that craving for chicken parmesan, I find it most satisfying to prepare it at home, with an abundance of love and of course great ingredients. 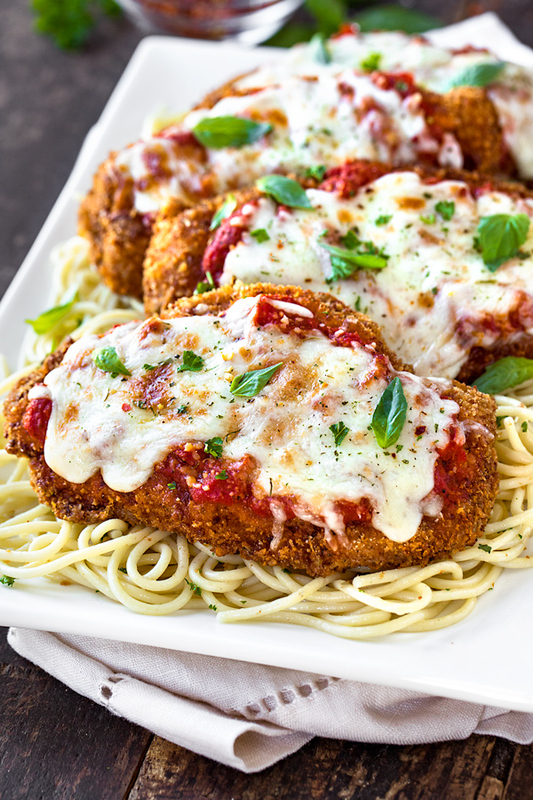 When I prepare my homemade chicken parmesan recipe, I like to go all out and add lots of flavor and love to all elements in the dish, ensuring that each and every bite is crispy, juicy, cheesy and delicious. For starters, I always marinate my chicken breasts using lots of garlic, olive oil, salt, pepper and even a squeeze of lemon. This ensures a moist, juicy and flavorful piece of chicken, one which serves as a delicious base for the rest of the recipe. The coating is another component where more flavor can be added, and I use a combination of grated parmesan cheese and panko breadcrumbs in mine. This provides an extra pop of parmesan flavor and light crispness. Then there’s the sauce, and that can pretty much make or break chicken parmesan for me. And when it comes to the cheese, I like to add a couple of hefty spoonfuls of grated parmesan over the sauce layer on the chicken followed by a generous sprinkle of whole milk mozzarella over top of that. Of course fresh herbs are a must, and I love fresh basil and fresh chopped parsley sprinkled over the finished dish for some added flavor and color. I’m not a fan of the sweeter style of marinara sauce, preferring rather lots of savory, herby, garlicy flavor in mine. I even love it when marinara sauce is slightly chunky, with little bits of diced tomatoes, so I whip up a quick and easy chunky marinara sauce for my version of this recipe that takes only 10 minutes to simmer. To begin, I marinate my chicken breast cutlets in some delicious, flavorful ingredients for at least 20 minutes, or even overnight if prepping ahead. While my chicken marinates, I whip up my quick and easy chunky marinara sauce, and keep that warm. Then, I add a coating of parmesan and panko bread crumbs to the marinated chicken before lightly shallow frying until golden and crispy. Finally, I spoon over some of my warm sauce, top with my cheeses, then place the chicken under the broiler just until the cheese is melted and gooey. I finish by sprinkling over some fresh basil and parsley, and serve with spaghetti and extra marinara sauce on the side! Crispy, saucy and cheesy, this chicken parmesan has loads of garlic-y flavor, and comes complete with an easy, homemade chunky marinara sauce! – Begin by marinating your chicken breasts: add the cutlets into a bowl, and add in about 1 tablespoon of olive oil, the 4 cloves of pressed garlic, a couple of good pinches of salt and pepper, the lemon juice and the Italian seasoning, and rub into the chicken; allow it to marinate while you prep your marinara sauce. – To prepare your chunky marinara sauce: place a sauce pan or small pot over medium heat, and drizzle in about 2 tablespoons of olive oil; add the 6 cloves of pressed garlic and stir to combine, and once the garlic becomes aromatic (about 30 seconds to 1 minute), add in the Italian seasoning and the dried oregano, and stir that in to combine. – Add in the tomato paste and stir to incorporate, then stir in the red wine, followed by the crushed and diced tomatoes; add about a scant teaspoon of salt and a couple of pinches of black pepper, then bring the sauce to a vigorous simmer, reduce the heat, and allow it to gently simmer, uncovered, for 10 minutes; keep warm. – To assemble the chicken parmesan: prepare your dredging station by adding the flour to one large bowl, whisking the eggs in another, and combining the panko with 1/2 cup worth of the grated parmesan in another. – Press each chicken cutlet in the flour, then dip into the eggs, then press into the panko/parmesan mixture; place the cutlets on a plate to hold while you heat your oil. – Place a large pan or skillet over medium-high heat, and add in enough olive oil to shallow fry (about 2 cups); allow the oil to become hot, then add the breaded chicken cutlets into the pan (work in batches if they don’t all fit), frying about 3-4 minutes per side, or until golden-brown and cooked through; allow them to drain on a wire rack for a few minutes. – Preheat your broiler on high. 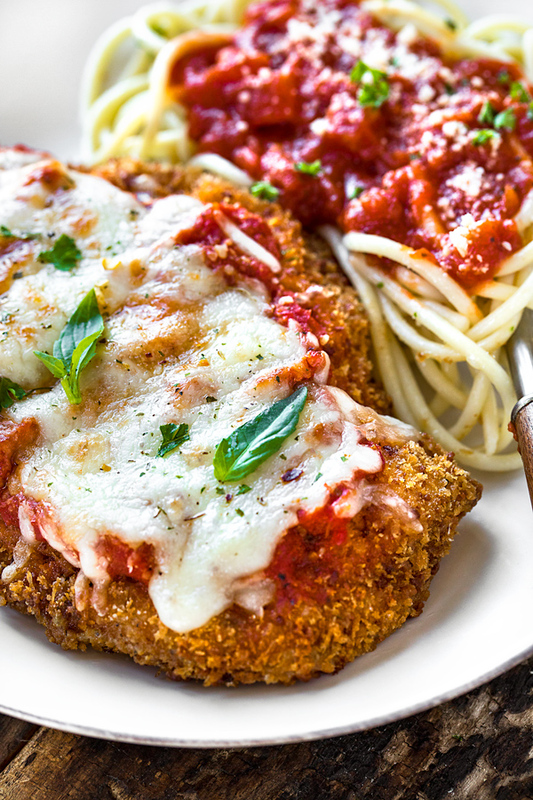 – Place your cooked chicken cutlets onto a foil or parchment-lined baking sheet, then top with several generous spoonfuls of the warm chunky marinara sauce; next, sprinkle about 1 tablespoon worth of the remaining grated parmesan cheese over the sauce of each piece of chicken, followed by about 1/4 cup of the grated mozzarella. – Place the chicken under the broiler for a few minutes, just until the cheese is melted and golden. 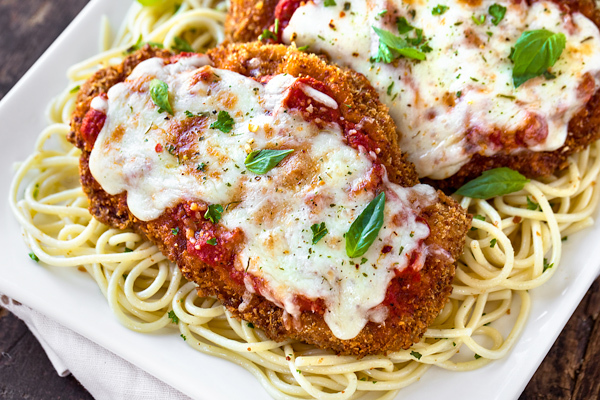 – Finish with the chicken parmesan with a generous sprinkle of fresh basil and parsley, and serve with spaghetti (or your favorite pasta) as well as some of the remaining chunky marinara sauce. Thinner chicken cutlets: I like to use large skinless, boneless organic chicken breasts, and slice them through lengthwise making thinner cutlets. These are quicker and easier to shallow fry, and ensure perfectly cooked-through chicken. 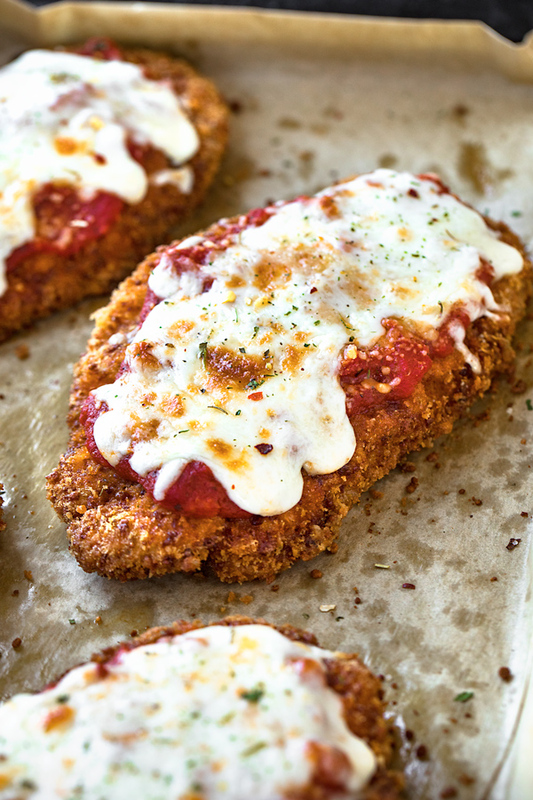 Crispy coating: Using both grated parmesan and panko crumbs is great way to make the coating extra flavorful and crispy, perfect for chicken parmesan. You can also use traditional breadcrumbs, if you prefer. Getting saucy: While you can certainly use a good-quality store bought marinara sauce for this chicken parmesan recipe, my easy chunky marinara requires only a few simple ingredients, and takes only 10 minutes to simmer up. And, it’s super delicious! Two cheeses: A little sprinkle of grated parmesan cheese along with the grated whole-milk mozzarella cheese adds that additional little pop of parmesan flavor! Side to serve with: Spaghetti or angel hair pasta is a classic side to serve with chicken parmesan, but you can serve it on a rustic roll, with garlic bread, or with a green salad! 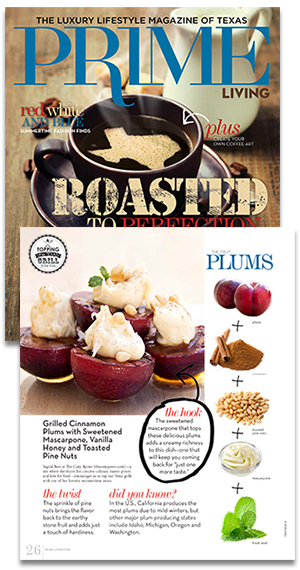 Hungry for more delicious Italian-inspired recipes? Check out this Baked Ziti, these Lasagna Roll Ups, these Italian “Drunken” Noodles, or this Parmesan Crusted Chicken!